AEON Kansai has 35 branch schools located throughout the prefectures of Osaka, Kyoto, Nara, Shiga, Wakayama, and Hyogo. The AEON Kansai Head Office is in downtown Osaka City. AEON schools can be found in the major city centers and throughout the suburban areas of Kansai. From the central Osaka stations, all schools can be reached in less than 90 minutes by train, making traveling to all areas of the region accessible for a day trip. More than 27 million people call the Kansai region home with about 3 million living in Osaka City. The Kansai region is known for its friendly and outgoing people, diverse cities, rich cultural history, and unique foods. The outward personality of Kansai’s residents reveals itself through their dialect of Japanese known as Kansai-ben, one of the most unmistakable regional dialects in Japan. Also, the people of Kansai are very passionate about their sports teams, especially for baseball. Other than being home to one of the most popular sports teams in Japan, the Hanshin Tigers, Kansai also hosts the annual summer high school baseball tournament where the top team from each prefecture is invited to compete for the championship. Kansai enjoys four distinct seasons throughout the year, with minimal snowfall in the winter as well as hot and humid summers. At its coldest in January the average temperature is around 5 °C (41 °F) and at its hottest in August, the average temperature is around 27 °C (90 °F). In every season, there are multiple festivals and activities to enjoy. 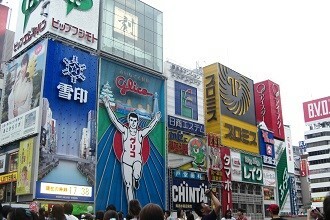 Kansai is a very exciting area that is full of both modern sites and historical landmarks. The Kansai region is home to five UNESCO World Heritage Sites located in Kyoto, Nara, Himeji and Wakayama. As mentioned, traveling from the central Osaka stations to most areas in Kansai can be done as a day trip. In addition, Kansai is centrally located in Japan so there is abundant public transport links to the rest of the country for those wishing to travel farther. For visitors and residents alike Kansai is home to five major cities: Osaka, Kyoto, Nara, Kobe, and Wakayama. Each is unique in its own way and offers numerous delicious foods, outdoor activities, and sights to enjoy. 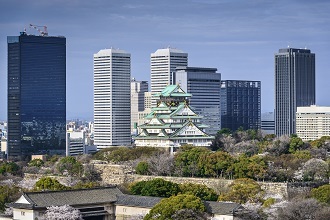 Osaka Castle and its surrounding park are popular spots for joggers and families looking to enjoy a day outside. In spring, the park is full of people barbecuing while enjoying the beautiful cherry blossom trees. Well-known districts of Osaka include Namba, Shinsaibashi, the Dōtonbori canal entertainment area, Nipponbashi, Den Den Town, as well as Amerikamura and Horie, each boasting unique products, atmosphere and ambiance. Along the Midosuji Line, the business districts of Honmachi and Yodoyabashi house the regional headquarters of large corporations. The city’s west side is a popular area that is home to Universal Studios Japan, the Kyocera Dome, the Osaka Aquarium, and Tempozan Harbor Village. Kansai people are passionate about food and there is an abundance of small restaurants and vendors that serve up the region’s specialties. The most famous foods in Kansai are okonomiyaki and takoyaki. 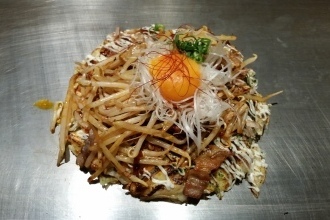 Kansai style okonomiyaki is probably the most notable food from Osaka. Somewhat resembling a large pancake, the flour-based batter is filled with delicious ingredients ranging from cabbage, pork, squid, onions, garlic (pretty much anything! ), and then cooked on a hot frying surface. Once finished, it is topped with a sweet sauce and crushed seaweed. A close second to okonomiyaki in terms of notoriety is takoyaki, which are ball-shaped dumplings containing a piece of octopus, pickled ginger and green onions. Takoyaki is served at restaurants but mostly bought from street stands or vendors who specialize in making the popular snack food. Kyoto was the nation’s capital for over a thousand years, earning it the historical nickname of the “City of Ten Thousand Shrines.” Kyoto is one of the few Japanese cities that still has an abundance of pre-war buildings, therefore it provides an ideal chance to experience ‘traditional Japan.’ Among the most famous temples in Japan are Kiyomizu-dera, a magnificent wooden temple supported by pillars on the slope of a mountain, and Kinkaku-ji, the Temple of the Golden Pavilion. Kyoto is home to many of the most famous temples and shrines in Japan and its beauty transforms depending on the season. Places like Arashiyama are a great example of this. In the spring, cherry blossoms bloom along the river and in the fall, the surrounding hillsides are awash with the oranges, yellows, and reds of the changing Japanese maple trees. On the healthier side, Kyoto is famous for tofu and certain specialty restaurants serve exquisite multi-course menus featuring only tofu prepared many different ways. Kyoto is the most popular tourist destination in Japan and millions of people travel to see its unique beauty each year. Just a few minutes train ride northeast of Kyoto, in Shiga Prefecture, lies Lake Biwa, Japan’s largest lake. Nara was the capital of Japan from 710 to 784, lending its name to the Nara period. Nara Prefecture has numerous UNESCO World Heritage sites, many within close proximity of each other. Spring and fall are both temperate and beautiful. The mountainous region of Yoshino has been popular both historically and presently for its beautiful cherry blossoms in the spring. In the fall, the southern mountains are equally beautiful with the changing oak tree leaves. 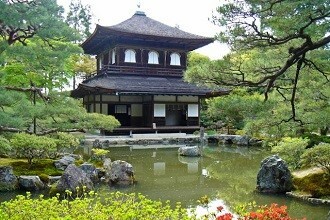 One of the most popular destinations in Nara Prefecture is Nara Park with its numerous temples and shrines. Nara Park is also home to tame deer which come up and eat right out of one’s hand. The oldest wooden structure in the world, Horyu-ji, and the largest wooden structure in the world, Todai-ji, can be found in Nara Prefecture. 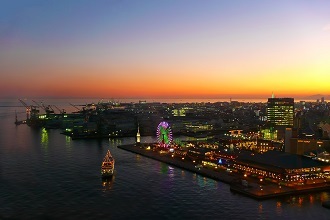 Kobe was one of the only cities to open for trade with the West in 1853 following centuries of seclusion. It has since transformed into a cosmopolitan port city with great shopping, spectacular night views, and an 18 meter tall robot statue! The city is the point of origin and namesake of one of the most famous meats in the world, Kobe beef, as well as the site of one of Japan’s most famous hot spring resorts, Arima Onsen. Kobe is also home to the longest suspension bridge in the world, the Akashi Bridge, which connects Honshu to Awaji Island. 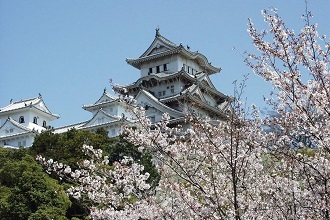 Further west in Hyogo is Himeji, which is well known for its beautiful, 700 year-old castle. After its recent refurbishment, Himeji Castle now truly lives up to its name as the White Heron Castle due to its pure white coloring. Wakayama Prefecture is famous across Japan for its umeboshi (salty pickled plums) and mikan (tangerines). Mount Kōya in the Ito District is the headquarters of the Shingon sect of Japanese Buddhism as well as being a World Heritage Site. It is home to one of the first Japanese style Buddhist temples in Japan and remains a site of pilgrimage as well as an increasingly popular tourist destination. People flock to see its ancient temples set amidst the towering cedar trees at the top of the mountain. Wakayama is home to a beautiful white sand beach called Shirahama beach, as well as numerous other beaches where teachers can enjoy swimming, surfing, scuba diving, or just taking in the picturesque coastal views. For those who may be tired after a full day exploring Wakayama’s beaches, spending the evening at one of the many ocean-side hot springs is a great way to relax. Click for more information about certain school locations in the Kansai region and comments from our teachers.